In a ruling in July, Judge Henry Abbott said a fellow judge had approached him about a case that was before him. THE PRESIDENTS OF the High Court and Circuit Court have issued a statement this evening saying that a conversation between two judges about a family law case had “no effect” on rulings. The statement follows an article in the Sunday Times yesterday that said senior family law judge Henry Abbott alleged a fellow judge, now named as Desmond Hogan, “tried to meddle” in a family law case that was before him. In Abbott’s ruling in July, he said he had been asked about aspects of the case by a Circuit Court Judge, who had approached him following a representation from a former TD on behalf of the mother of the child in the case. The joint statement from the two court presidents today said that any allegation of this nature is “of grave concern to the judiciary”. 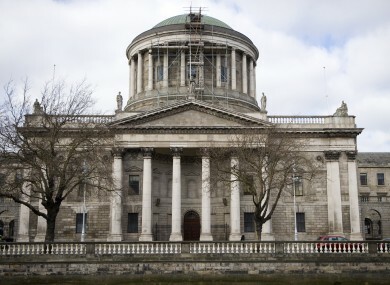 The President of the High Court sought an account from Abbott of the conversation between the two judges and the judge said that just a few days after his ruling in July 2010, he encountered Hogan in the yard of the Four Courts. In the course of a casual conversation Judge Hogan asked was it true that he had made a particular order in the case in question, a query to which Judge Abbott took exception and dealt with by saying that the reasons for his decision would be detailed in a written judgement in due course. The same was later delivered on 26 July, 2011. The making of this inquiry to Judge Abbott was the subject of certain questions put by Judge Abbott of one of the parties during a later hearing on 15 February, 2013 and was subsequently referred to by Judge Abbott in his ruling on 12 July, 2013. The statement also said that Judge Hogan stated that he is unable to recall the conversation or how he came by the information that a particular ruling had been made at that time. However he would not dispute that he may have asked about it in a casual way and asserted that he had “no solicitation or request” from any politician or from any party involved in or connected with the case. “There had been absolutely no intention of interfering with the case or influencing its outcome in any way and he deeply regrets that his query may have given rise to any such apprehension,” the statement said. While the presidents acknowledged that the incident “should not have happened” they said it could not have influenced Abbott in his ruling as it was made in the aftermath. They added that they were further satisfied that this conversation had “no effect” on the judge’s further ruling on the case in July of this year. Email “Conversation between two judges on family law case had 'no effect' on ruling”. Feedback on “Conversation between two judges on family law case had 'no effect' on ruling”.